Join Maxwell's at the Club (500 N. Kingsbury St., Chicago, IL; located inside East Bank Club; 312-527-5800) after work and into the evening for a great mix of live entertainment in the bar/lounge. To make your evening even more satisfying, you can order from Maxwell's special bar food menu, filled with freshly prepared appetizers, small plates and flatbreads. If you would like to enjoy a delicious full dinner while sitting in the bar/lounge area, you can order from the regular Maxwell's dinner menu. Maxwell's has a fully-stocked bar with an excellent wine selection, craft beers and flavorful cocktails. So, unwind at Maxwell's at the Club with wonderful live entertainment, every Tuesday through Friday. No membership is required and there is never a cover charge. Enjoy the smooth, groovin' sounds of Chicago's own Midnight Sun as they deliver Motown and R&B favorites from artists such as Michael Jackson, Earth Wind & Fire, Phil Collins, Aretha Franklin, and a of host other soulful artists. Focusing on classic rhythm and blues, more contemporary "quiet storm" vocal tunes, plus pop hits and standards, they soothe your soul like few artists can do. Midnight Sun has a polished and poignant sound that makes for a refreshing, toe-tapping evening. A formally trained and technically accomplished Flamenco guitarist, David Chiriboga has a fluid and expressive style that captures the spirit and soulfulness of musical styles from Spain and Latin America. He blends the traditional Flamenco music of Spain with the punchy rhythms of South America to create a captivating musical landscape. With the trio's heartfelt strumming, you're sure to have a memorable evening of entertainment at Maxwell's. Master of the eighty-eights, Robert Solone is one of Chicago's most in-demand pianists and piano bar performers who regularly appears as a soloist and accompanist. He also is an accomplished vocalist, skillfully performing a set of richly textured selection of show tunes, pop song, original compositions, classical works, jazz and blues. Don't miss an evening of piano jazz with Bob as you will e enjoying one of Chicago's finest, weaving a colorful tapestry of familiar tunes performed with a master's interpretative touch. Friday night in Chicago would not be complete with some great straight-ahead Chicago-style jazz to wind down after a busy week. Ken Haebich, Redd Hold and Friends fill the bill perfectly with thfunky arrangements of jazz, blues and pop classics. The trio features Ken Haebich on bass, Redd Holt on drums and other special guests. Redd was an original member of the Ramsey Lewis Trio and a principal member of the Young-Holt Trio. Ken is a bassist's bassist, a multi-faceted bassist, composer and music educator. Versatility is the signature of this group. They can move easily from old school jazz to contemporary modal compositions and familiar pop standards. Another way of saying this is that they can play as cool as a calm winter's night or as hot as State Street on an August night. Maxwell's at the Club is proud to be the Friday evening home of these outstanding musicians. Open to the public and accommodating to all tastes, Maxwell's at the Club is as perfect for business entertaining as it is as a neighborhood hangout for friends and family. Its ambiance, quality food and very personable service make it a truly hidden gem in Chicago's popular River North area. Maxwell's at the Club is located in Chicago's East Bank Club (500 N. Kingsbury St., 312-527-5800, Ext. 301). It is open weekdays for lunch 11:30 a.m.-2:30 p.m., and 5:30 p.m.-9:30 p.m. for dinner. The bar/lounge area is open 11:30 a.m.-9:30 p.m., Monday through Friday. Maxwell's serves brunch every Sunday, 10 a.m.-2 p.m. Valet parking is available across the street. For more information, please visit www.maxwellswattheclub.com. Great Holiday Shopping. Don't forget HoliDose this Sunday! Green City Market will be at Dose Market taking place this Sunday at VenueOne, 1034 W. Randolph. Dose Market is a great place to pickup last minute holiday gifts. 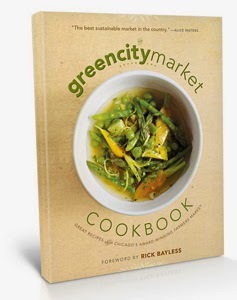 Green City Market volunteers will be on hand with Green City's new Cookbook, wrapped or unwrapped it's the perfect gift for the foodie in your life! makers, bakers artisans, entrepreneurs and, well, us! Cheer alongside our fair city's finest in food, fashion and fun and take home delights for everyone on your list. It's the HoliDose! December 14th, 10 a.m. to 5 p.m. Kids under 12 always free. No pups. Street and valet parking available. CTA Morgan Street station nearby. While many seniors are supportive of the green and sustainability movements that have become mainstream, few have rolled up their shirtsleeves, literally, to transform their views into practical action that makes a difference. One significant and inspiring exception is the community of seniors who live that the Concord Place Retirement & Assisted Living Community in suburban Northlake, Illinois, just west of Chicago (401 W. Lake Street, Northlake Illinois 60164; telephone 708-365-9251). There, the residents have designed and maintain what they call their Harvest Rooftop Garden. This hydroponic garden is a collaborative effort between the residents and Concord Place's production manager, Samantha Lewerenz, who was integral in getting the system up and running to its full potential. She trained the residents in how to plant and harvest their bounty, and how to increase production. The Garden was installed in the spring of 2014. David Friedman, whose company, F&F Realty, owns and operates Concord Place, is very passionate about the sustainability movement and using local food sources. He hired a gardening consulting firm, Topiarius, to transform the existing rooftop greenhouse, which grew flowers the traditional way, into a modern hydroponic growing facility. It was an exciting undertaking. "The Rooftop Hydroponic Garden has become a place that is easily accessible for the residents and encourages them to learn, grow, share knowledge and enjoy the harvest," said Friedman. "It has given many of our seniors a sense of purpose. They are able to grow their own food which is used in Concord Place's kitchen. 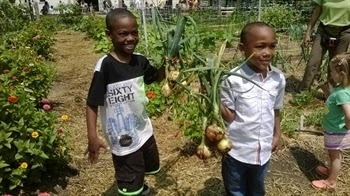 They are actually taking part in feeding their own community, while learning about local food sources and sustainability." The community grows a variety of sustainable fruits, vegetables and herbs in the garden. Among them are parsley, oregano, cilantro, thyme, mint, parsley, dill, fennel, basil and a variety of lettuces, including a gourmet blend. They also are experimenting with Swiss chard, sugar snap peas and microgreens. Approximately 30 pounds of lettuce are harvested at a time, along with a few pounds of herbs. Some of the produce is used in the living facility and some is shared with local restaurants. "We wanted to make sure that we didn't waste any surplus produce," said Friedman, "so we arranged for the surplus to be used by our company's restaurants." Currently Concord Place is sharing its bounty with seven restaurants. Among them is Glen Prairie in Glen Ellyn, Illinois which prides itself on its local initiatives. Other restaurants using the produce are Dine Restaurant and Metro Klub in Chicago; Chicago Fire Oven in Rosemont, Illinois; Karma Asian Cuisine & Fine Wine and Karma Pub in Mundelein, Illinois; and Birch River Grill in Arlington Heights, Illinois, all of which are committed to using local ingredients. While hydroponic gardening is very efficient-its uses 90 percent less water than a traditional garden because the water is recirculated-it is quite a different process than traditional gardening, and there is a definite learning curve. But after several months of learning and refining the system, the hydroponic garden is becoming stable and surprisingly productive. Hydroponic garden involves several steps. First, plant seeds are inserted into seed starter trays on the propagation table, where they are carefully watered. After they spend from one to three weeks there, the young plants are moved to a second table, where they spend another two weeks to develop a root system. Then they are moved to the hydroponic medium containing the necessary nutrients to enable them to grow to maturity. The system includes a simple gutter circulation system which allows the water be retained and recirculated throughout the garden. "In some ways, this is easier than traditional gardening," said Lewerenz. "But since it's a new way of doing things, there are many aspects of the process that need to be learned." For example, the gardeners have learned that they must maintain a good pH balance in the water for the plants to do well. They also try to keep the temperature of the garden, which is inside a greenhouse environment, as controlled as possible. But given that the air temperature outside changes with the seasons, they have learned that the inside temperature does vary. They have discovered that summer vegetables, such as tomatoes and cucumbers, do better in the summer, while cooler weather crops, such as peas, are better grown during the colder months. The herbs tend to do well throughout the year, which is a bonus for the residents and the chefs in the Concord Place kitchen. In keeping with the accessibility needs of the more elderly residents, all tables in the garden are tall so that residents don't have to bend over to do their gardening work. "We are still expanding the garden and haven't reached full capacity yet," said Lewerenz. "We are experimenting with other specialty greens and edible flowers such as violas and nasturtium, which has an edible, peppery-tasting flower. We also have a Dutch bucket system in which we are growing tomatoes and cucumbers. We are using as many natural and organic methods as possible to produce the best nutrient-rich products. Hydroponic gardening systems use up to 90 percent less water than traditional irrigation systems; the system recirculates the water. We are hoping to incorporate a compost system and we may be able to install some raised beds on the roof area outside the hydroponic garden." The residents of Concord Place have been very involved with the Hydroponic Garden. There has been a core group of residents who have spearheaded the daily gardening activity-seeding, maintaining and harvesting. They also help make decisions as to what to grow. The residents can come and go as they please to care for the garden, and when families come to visit they can join in. Reactions have been very positive. One resident said, "So much work goes into getting those little seeds into those pots. But then you see what comes," said resident Louise "Wheezy" Dellert. A growing number of residents are becoming involved with the garden and, of course, they like to share a nibble or two while they're working. Some residents even help move the process along by growing plants in their apartments. The facility's chefs stop by to pick what they need for the day's menus. "It has been great to bring the residents together through a food based program," said Lewerenz. "This is a very good way to interact, and the residents are learning to try new things and enjoy new flavors. We plan to work closer with the residents to get them more involved, providing them with educational opportunities and helping to facilitate more community relationships within the residential community. There are many hydroponic gardens being set up in the area, but none in a retirement community that involves and benefits the community like this one. We're really proud of what we've been able to accomplish so far. We hope to provide many of the greens used at Concord's kitchen. It doesn't get any more local than that!" Conveniently located at 401 W. Lake Street in Northlake, Illinois 60164. Concord Place Retirement & Assisted Living Community offers an exceptional and affordable retirement living, supportive living and assisted living community in and around the Chicago area. At Concord Place Retirement & Assisted Living Community residents take part in a wide variety of social, educational, and recreational activities. Life is always exciting! There is always something to do, someone new to meet, or someplace to go. Take part in daily events, trips and a variety of special activities. The fine, restaurant-style dining offers a very wide variety of menu options prepared daily by a gourmet chef. The restaurant is open all day so that residents are served based on their own schedule. At Concord Place, they not only feed the soul of their residents, but their body as well. For more information about Concord Place Retirement & Assisted Living Community, please contact them at (708) 365-9251 or visit their website at www.concordplace.com. Labels: " "Northlake IL", "Chicago area Hydroponic Gardens", "Concord Place", "Kurman Communications", "Senior Living", "Senior Residence in Chicago area"